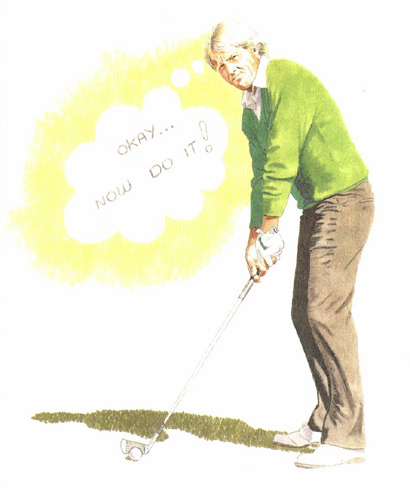 Positive reinforcement is a term from Psychology 101, but it might as easily have been coined on the golf course. Every player likes to hear words of encouragement as he faces a tough shot, and congratulations after he pulls it off. Unfortunately, unless you play golf with your mother, you can't depend on hearing these things. That's why I talk to myself. Not aloud, but inside my head. The tougher the shot I'm facing, the more I talk. If I'm on the last hole of a tournament, facing a long iron shot to the green and needing a birdie to win, I'll say to myself something like, 'You know this shot cold, you've knocked it stiff a thousand times, and now you're going to do it again.' Those are nice words to hear as you settle over the ball - even if they're coming from your inner self. I also talk after I hit shots. After a particularly long, straight drive I'll often say, 'Damn, Greg, I'm pretty impressed by that one.' These inner words can be even more encouraging than the cheers of the gallery. You don't want to linger too long on your shots - good or bad - but you do want to stamp the good ones on your mind for future reference in pressure situations. Silent self-congratulation is one way to do that.